Maroon 5 have been confirmed as the 2019 Super Bowl half-time show headliners – alongside rappers Travis Scott and Big Boi. It’s one of the biggest gigs in the world – more than 100 million people watched Justin Timberlake’s 2018 show. But Maroon 5’s decision to perform next month isn’t without controversy. There have been calls for them to pull out because of the NFL’s stance over some players refusing to stand when the US national anthem is played. The Super Bowl half-time show takes place during the NFL’s championship game, and artists who’ve performed there include Beyonce and Lady Gaga. But it’s been rumoured that some big stars – including Rihanna and Cardi B – have refused to perform at the show. Since 2016, some American football players have refused to stand when the US national anthem is played at NFL games in protest against the treatment of black people in the US. It was started by former San Francisco 49ers player Colin Kaepernick, who first sat and later kneeled while other players stood. These actions angered President Donald Trump, who has called for players who “disrespect” the US flag to be sacked. In May last year, the NFL announced that teams would be fined if players kneeled for the US national anthem. An online petition urging Maroon 5 to reconsider their decision to perform has more than 84,000 signatures. Fans of the band posted messages of support and excitement when the band shared a teaser video on their Twitter page. “I’ll be watching. Thanks for not succumbing to the pressure not to play,” one person wrote. But some fans of Big Boi, who made his name in Outkast, were less positive about his decision to appear when he shared a news story about his performance online. “I respect your hustle but coming from Atlanta, I would expect more from you,” wrote one follower. Other fans supported his decision to perform while some said the rapper should kneel during his slot to support the protesting NFL players. 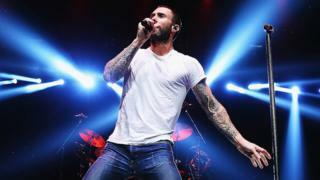 Maroon 5’s appearance at Super Bowl 2019 had been speculated for a long time, but there have been rumours they’ve found it hard to find anyone to appear with them. It shouldn’t have been that difficult, considering the band’s long list of collaborators include Future, 50 Cent, Nicki Minaj, Kanye West, Wiz Khalifa and – most recently – Cardi B. Their song, Girls Like You, was one of 2018’s biggest. But Cardi was reportedly uninterested in performing at the Super Bowl because of how she feels about Colin Kaepernick. Now, it seems Travis Scott has only agreed to the performance as long as the NFL matches his personal donation to social justice charity Dream Corps. Travis Scott hasn’t mentioned his appearance on his social media channels yet. The Super Bowl takes place on 3 February 2019 in Atlanta.